Well-thought-out and well-developed listing presentations are critical to winning new real estate listing business. A key component of a successful listing presentation is the property marketing plan. A Property Marketing Plan should be comprehensive and include more than websites where the property will be listed. It should be a key part of your listing presentation so that your prospective client will understand why you are the best choice to sell their home. 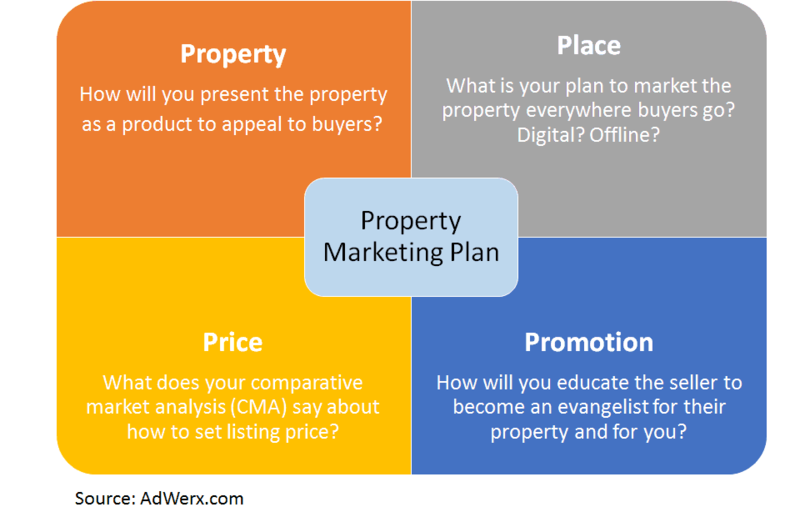 Property Marketing Plan – 4P and 4E Marketing Mix Framework Adapted for Real Estate Marketing. Property is the Product, Pricing set by CMA and Agent Experience, Place is Everywhere, Promotion requires Education. Property – One of the most important activities sellers think about when enlisting an agent is how you will help to prepare the house for sale. This includes things like providing ideas on staging the home, understanding what buyers are looking for regarding homes in the local market and service provider referrals to perform necessary home improvements and repairs. Price – There are many tools that will create comparative market analyses (CMA). A good example of a CMA report is from Cloud CMA. What the CMA won’t tell the seller is how to market the home to take advantage of perceptions in addition to facts alone. Buyers may be looking for a home to raise their families which will create a different set of criteria beyond the listing price, number of bedrooms, etc. Your ability to understand how to create an emotional impact on potential buyers (e.g. use of colors and decor to attract families) will help to create a story beyond the facts of the CMA. This will be helpful to set the correct price based on your experience. Place – There was a time when having an open house for a property was sufficient to attract buyers. Today, buyers use a variety of sources to discover homes including the Internet, yard signs, mobile apps and referrals from friends. Your marketing plan should communicate the tactics and channels you will use to market your seller’s property. Properties need to be marketed online and offline everywhere buyers shop and look for information. This includes websites beyond Zillow, Realtor.com and Trulia. AdWerx was created to market your listings to local buyers where ever they go online. Promotion – Education is a critical component of the value that real estate agents bring to the listing and sales process. Good promotion strategies start with showing your potential customers why they need you. Secondly, by doing a thorough job of educating clients about the process, your clients can be promoters for their property and for you. Clients are an excellent source of referrals and recommendations. Why is this important? According to NAR, 38% of sellers used an agent from a referral and 23% used an agent from a previous buying or selling experience. AdWerx was developed to seamlessly prompt your client to promote their home and recommend you. Many technologies can be pulled together to automate all of the dimensions of your Property Marketing Plan including slick presentations on iPads and other devices. Nevertheless, the listing presentation should be thought of as a conversation for you to sell your value to the prospecitve client by demonstrating your track record, conveying honesty and trustworthiness and showing your knowledge of the market. This is the key in making the seller comfortable that that you will do everything in your power to sell their house. If you have other tips about how to prepare for killer listing presentations, let us know! Like to learn more. Please contact me. Thanks. Mary Jo, we’d love to talk! We are here Mon-Fri 9am-6pm EST, and Sat 9am-5pm EST. Feel free to give us a call whenever you are free at 888-746-5678. Thank you!